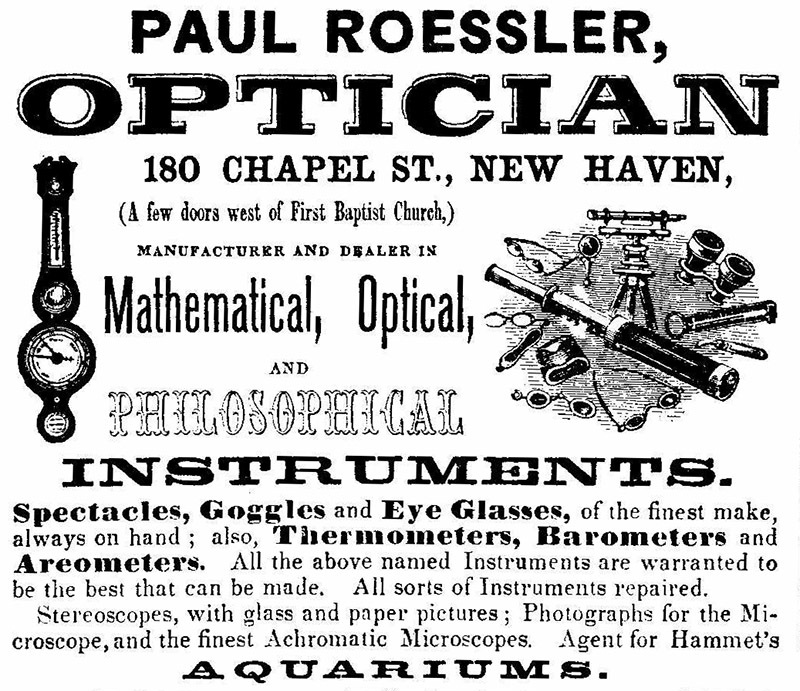 Paul Roessler, of New Haven, Connecticut, described himself as an “optician and mathematical instrument maker”, and “manufacturer and dealer in mathematical, optical, and philosophical instruments”. Advertisements and city directory entries indicate that he sold microscopes, custom-made spectacles, telegraphs, surgical instruments, and a wide variety of other apparatus. He regularly offered microscopes from Germany and France. In addition, Roessler manufactured at least two types of microscopes (Figures 1-5). Both of these microscopes are relatively rare nowadays. Asa Gray (1810-1888), Professor of Botany at Harvard University, published numerous works on that topic. His Gray’s School and Field Book of Botany was reprinted every year or so from the 1860s through at least the 1880s. 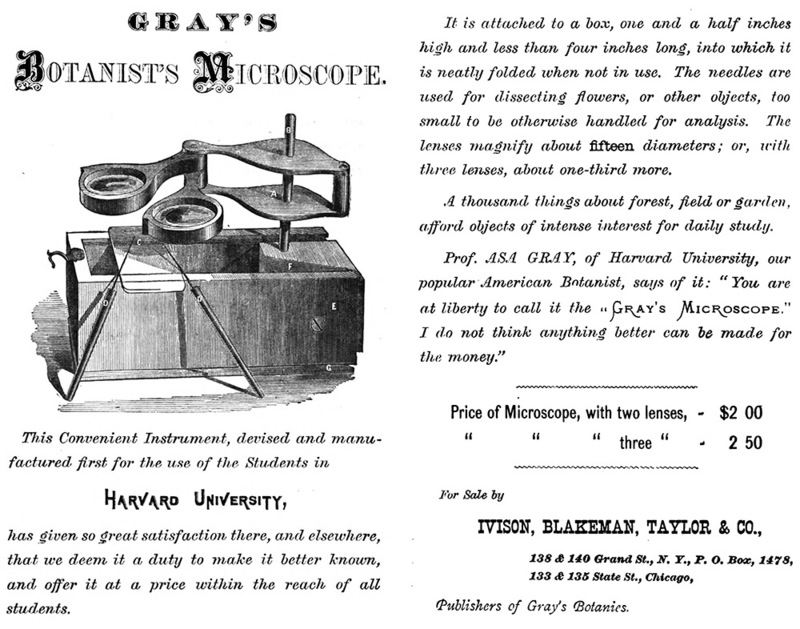 From the 1870 edition onward, the book included an advertisement for “Gray’s microscope” (Figure 2). This was a small simple arrangement, consisting of two low-power lenses mounted in cow’s horn, a small wooden box (measuring less than 4 inches / 10 cm), an upright steel rod to hold the lenses, and a standard glass slide that served as the stage (Figures 1-3). Roessler later stated that he conceived of this microscope in 1868. Gray’s attention was called to Roessler’s design in 1870, “and he was so well pleased with them that he wrote a letter to Mr. Roessler … Dear Sir, I have yours and the microscopes. I like them very much and you are at liberty to call them the ‘Gray Microscopes’ if you see fit”. This microscope could be purchased through Gray’s publisher, or directly from Roessler. In 1892, Roessler sold these simple instruments for $1.40 with two lenses, and $1.65 with three. Roessler also sold case-mounted microscopes that more or less resemble the design of Francois-Vincent Raspail (1794-1878) (Figures 4-6). Some surviving examples have Roessler’s trade label pasted inside the case, while others have his name engraved on the body. Some are very similar to French-made microscopes, with stages mounted with dovetail fittings, and may well have been imported from Europe (Figure 6). However, he also sold a rather distinct form, with several differences from the usual “Raspail”-form, including a permanently-mounted stage (Figures 4 and 5). The latter are probably the microscopes that Roessler is known to have made in 1866. A description was provided by a May 15, 1866 letter from Asa Gray to George William Clinton (1807‑1885), stating that Paul Roessler, “under Eaton's directions has perfected a simple microscope, with the two most useful powers (low) just what is wanted for Phaenogamous & Fern Botany ‑ as good as my French microscope simple Cost $15”. (Note: “Eaton” was Daniel Cady Eaton [1834-1895], Professor of Botany at Yale). Clinton promptly wrote to Roessler on May 19. Roessler wrote back on May 26, 1886, “Dear Sir, Your note of the 19th this month I received with enclosed $20.00 Greenback. I had to make your microscope as all I had ready are sold, all over the country”, with notations of the microscope costing $15, plus additional apparatus adding up to $20. Two significant points can be taken from these exchanges. First, Roessler manufactured the microscope that was ordered by Clinton, producing one on demand within a few days of receiving the order. Second, Gray stated that Roessler was then manufacturing a microscope under the directions of Professor Eaton, who had been Gray’s student. 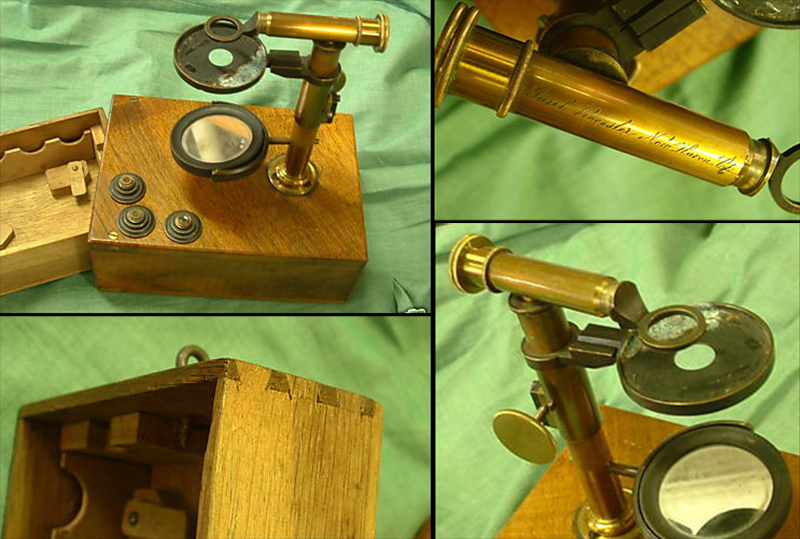 This was a simple microscope that included two lenses, and cost $15 (considerably more than the very simplistic “Gray’s microscope”, which was introduced in 1868-1870). Figure 1. A “Gray’s microscope”, produced by Paul Roessler. The address on the label, 251 Chapel Street, New Haven, was Roessler’s business address from 1862 until 1882. Adapted for nonprofit, educational purposes from an internet auction site. Figure 2. A two-page advertisement that was published in Asa Gray’s 1870 edition of “School and Field Book of Botany”. This marked the first appearance of these advertisements, which were included in all subsequent editions. Previously, Gray alluded to such a microscope design, although he did not provide an illustration or source, “We suppose the student to be provided with a hand magnifying-glass, and, if possible, with a simple microscope, i.e. with a magnifying-glass, of two or more different powers, mounted on a support, over a stage, holding a glass plate, on which small flowers or their parts may be laid, while they are dissected under the microscope with the points of needles (mounted in handles), or divided by a sharp knife”. Roessler’s design is very similar to Gray’s description of an ideal student’s microscope. Figure 3. An 1892 advertisement from Roessler. He stated that he developed this instrument in 1868, and it was adopted by Gray in 1870. Those dates are consistent with the first appearance of this microscope in the 1870 edition of Gray’s botany book. Figure 4. 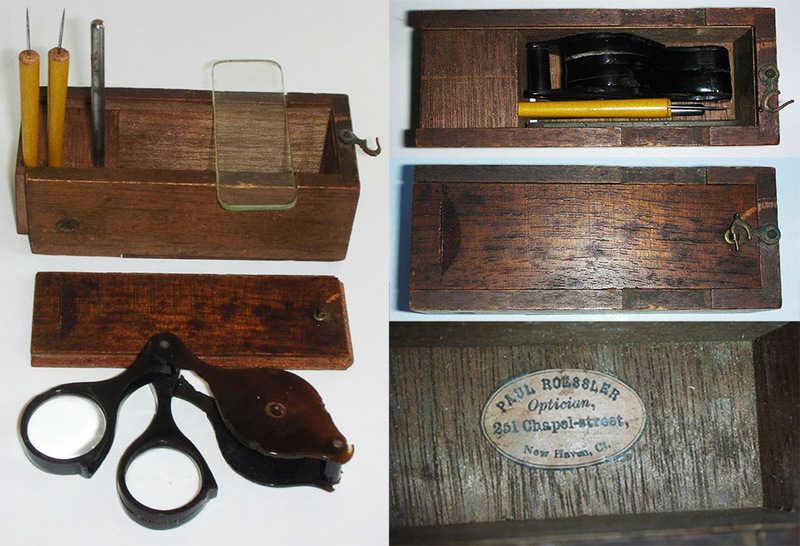 A case-mounted simple microscope with Paul Roessler’s 1862-1882 trade label. Sold with two simple lenses, this is most likely the $15 microscope that he manufactured and was described by Asa Gray in 1866. While it resembles the French “Raspail” design (see Figure 6), there are notable differences. The knurled nob on the arm does not adjust the position of the lens - it is merely an ornament that screws into the arm. The stage is permanently screwed onto the upright limb. The trade label pasted inside the drawer refers to the 1859 Silver Medal that he won at the Connecticut State Fair (see Figures 8 and 9). Figure 5. 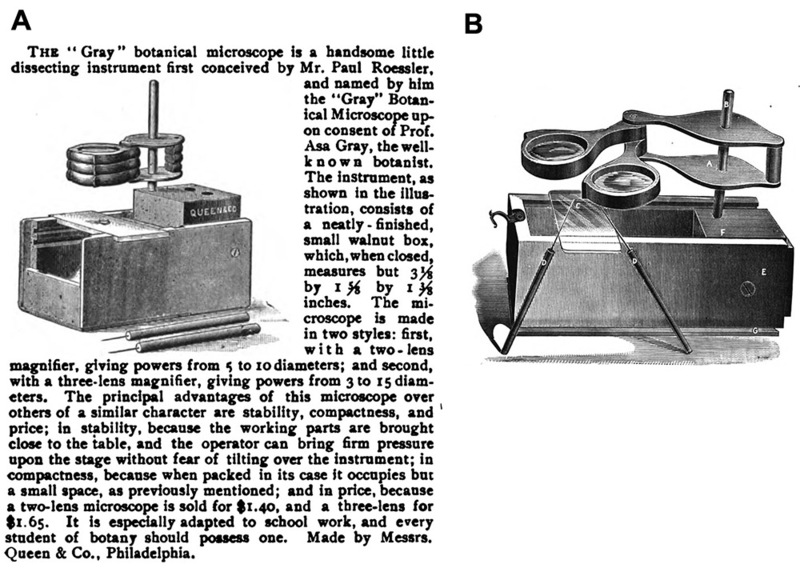 Essentially the same model of microscope as shown in Figure 4, with Roessler’s name engraved on the horizontal piece. This specimen includes a rack for tools within the storage drawer, while the specimen shown in Figure 4 does not show any evidence of ever having had a storage rack glued in place. Adapted for nonprofit, educational purposes from an internet retail company. A similar Roessler microscope is shown as instrument 100 in Raymond Giordano’s “Singular Beauty” (page 53). Figure 6. A “Raspail”-type microscope, engraved on the arm with Roessler’s name and address. This instrument is identical to French-made microscopes of the period, with a screw in the arm that adjusts the position of the lens, and a removable stage that attaches with a dovetail joint. Roessler advertised that he sold microscopes imported from France, of which this is probably an example. Adapted for nonprofit, educational purposes from an internet auction site. Paul Roessler was born in Berlin, Prussia on August 11, 1829. He was operating his own optical business within two years of his emigration to the USA, implying that he had received training in those skills in Germany. He arrived in New York City on October 23, 1853. 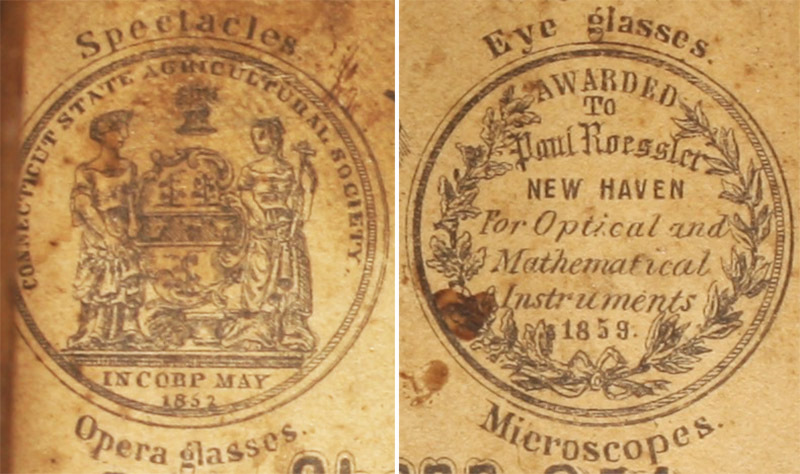 In 1859, Roessler won a Silver Medal for his display at the State Fair of “optical instruments, and mathematical instruments, microscopes, opera glasses, steel spectacles and eye glasses” (Figure 8). This award was then featured in his trade labels, such as those glued inside many of his microscopes (see Figures 4 and 9). In about 1860, Roessler married one Sarah E. (last name not known). They had four children, two boys and to girls. The eldest son, Paul died in 1878, when he was only 8 or 9 years old. The younger son, Fritz, took over his father’s optical business in the early 1890s. The eldest daughter, Pauline, married William Grunow, son of the noted Connecticut microscope-maker of the same name (who partnered with his brother as J. & W. Grunow). The 1860 census recorded that Roessler employed an apprentice, Frederick Atwood. Roessler’s position as a master indicates that he was a highly-skilled optical craftsman. Roessler moved his shop during 1861, to 251 Chapel Street. The above-described exchange of letters between Asa Gray, George W. Clinton, and Paul Roessler in 1866 indicate that Roessler was then producing a botanical microscope with two different lenses for $15. Soon afterward, in 1868, Roessler began producing a very simple microscope. That instrument may have been inspired by Gray’s words in his School and Field Book of Botany, “We suppose the student to be provided with …, if possible, with a simple microscope, i.e. with a magnifying-glass, of two or more different powers, mounted on a support, over a stage, holding a glass plate”. 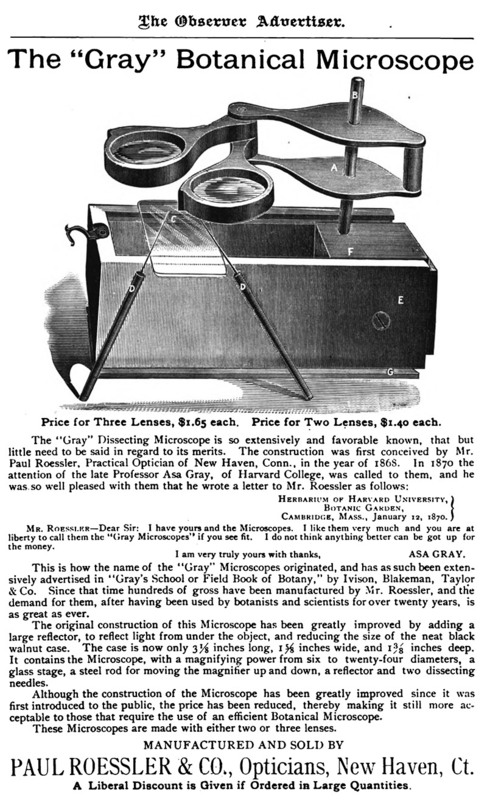 According to Roessler, he and Gray began coordinating in 1870, with Roessler producing the “Gray’s Microscope”, and Gray advertising it in his popular books (Figures 2 and 3). The 1868 Yale College Courant emphasized the connections between the college and Roessler, “Many a Yale graduate visiting Berlin has found a letter from Mr. Roessler of great service to him. His mathematical, philosophical and optical instruments he imports from his native land, and they are acknowledged by every one to be of the first quality. The members of the Scientific School find Mr. Roessler almost indispensable. His stock of opera glasses is very superior. You will find him a gentleman in all his dealings”. 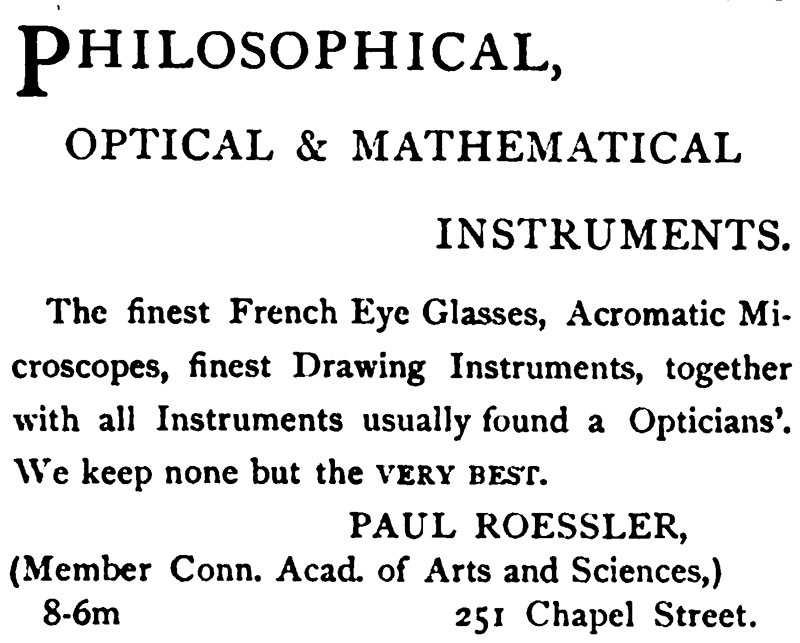 An 1870 advertisement noted that Roessler had “just returned from Europe with a fine assortment of optical, mathematical and philosophical instruments”. Passport records indicate that he made similar trips at least three more times over the next twelve years. 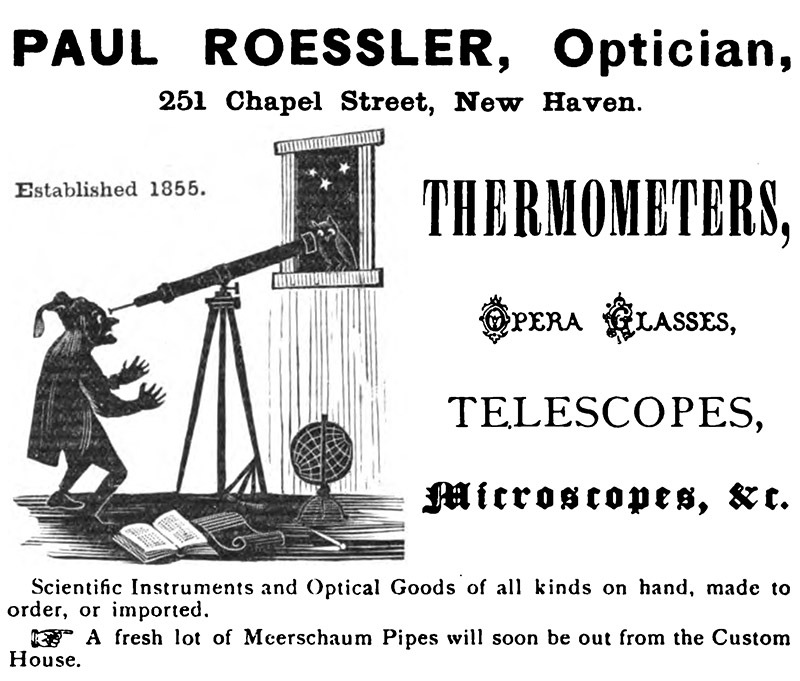 In addition to corrective eyeglasses and simple microscopes, Roessler was adept at producing mechanical apparatus. In 1880, he was noted as manufacturing a parallel ruler on the design of Yale geometry instructor F.R. Honey (Figure 14). Roessler moved his shop to 71 Church Street during 1882 (Figures 15-16). 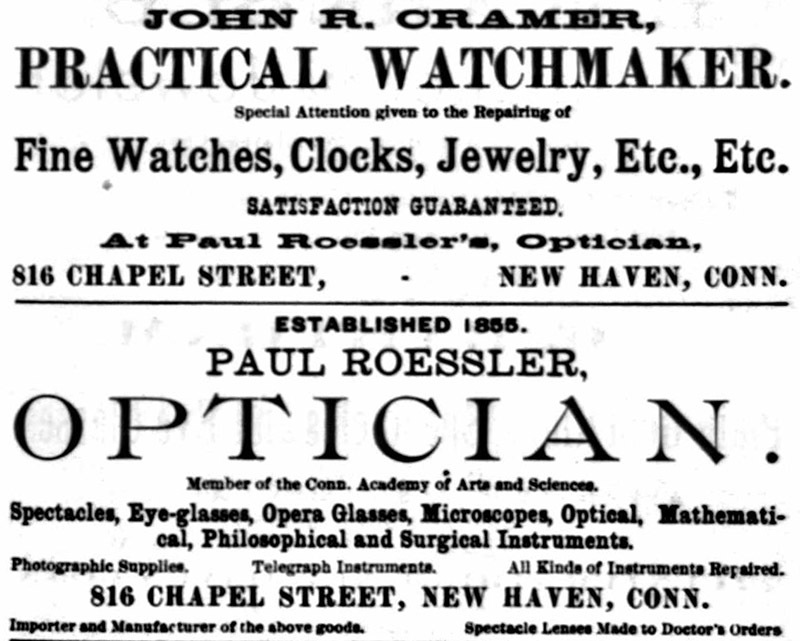 The 1883 New Haven Directory indicated that he shared his space with a watchmaker, John R. Cramer (Figure 16). A logical collaboration, that relationship continued for many years afterward. Roessler moved his shop again in 1887, to 816 Chapel Street (Figure 17). During 1890, Roessler formed a partnership with W.F. and R.P. Sternberg. 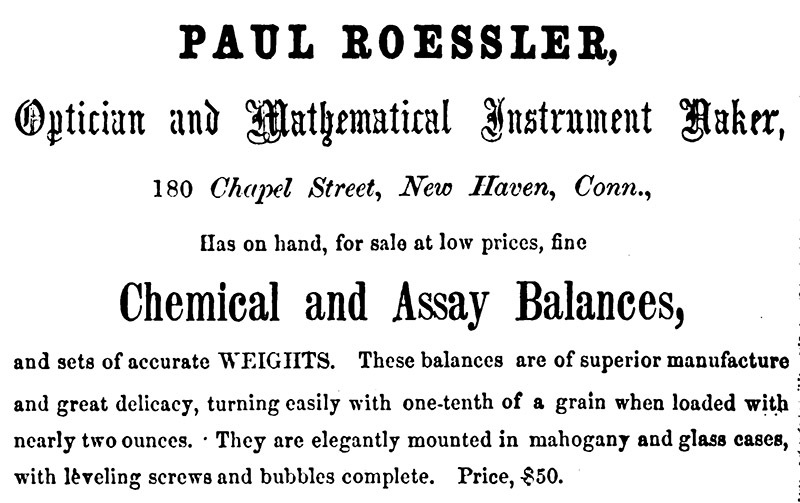 Their business was known as “Paul Roessler & Company” (Figure 18). Paul Roessler retired in 1893, and son Fritz took over his position. The firm was now named “Roessler & Company” (Figure 19). The partnership evidently sold the rights to “Gray’s microscope” to Queen & Co., of Philadelphia (Figure 20). The partnership was dissolved the next year, with Fritz as sole owner, and operating as “Paul Roessler’s Son” (Figure 21). A new partnership was established in 1900, becoming “Fritz and Hawley”, which remains in business today. Paul Roessler died on February 6, 1904. Figure 7. An 1858 advertisement. His first shop was located at 180 Chapel Street. Figure 8. 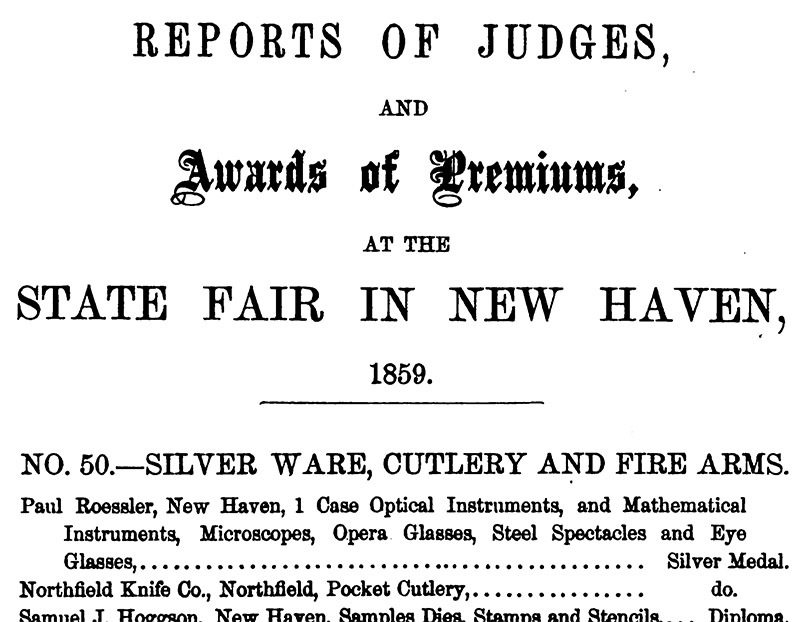 Excerpts from “Transactions of the Connecticut State Agricultural Society for the Year 1859”, reporting awards from that year’s State Fair. Paul Roessler was awarded a Silver Medal (very few gold medals were awarded, in a limited number of categories, and most honorees won a dollar or two as a prize). Roessler referred to this medal in his trade labels - see Figures 4 and 8. Figure 9. Roessler’s labels that were pasted inside instrument cases featured illustrations of his 1859 Medal (see Figure 4). Figure 11. An 1867 advertisement from “The Yale College Courant”. City directories indicate that Roessler moved to 251 Chapel Street during 1861. Figure 12. An 1870 advertisement from “The Yale Banner”. Note that Roessler reports to have personally imported a variety of instruments. Figure 13. An 1876 advertisement from “The Yale Literary Magazine”. Figure 14. Diagram of a parallel ruler, designed by Yale geometry instructor F.R. 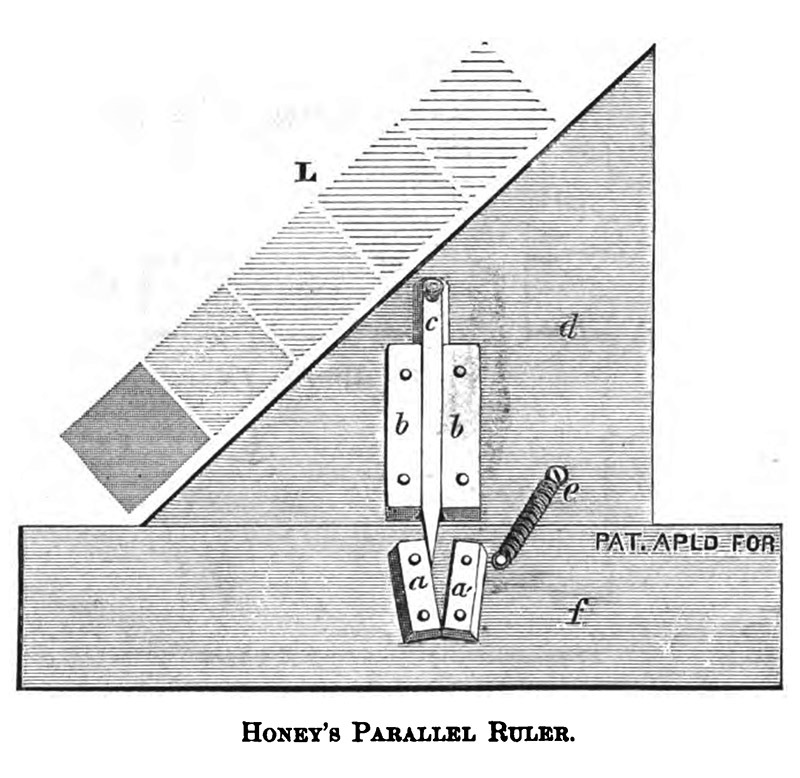 Honey, and manufactured by Paul Roessler. From an 1880 article on the device that was published in “The American Machinist”. Figure 15. An 1882 advertisement. Roessler moved from 251 Chapel Street during this year (see Figure 13). From “Beckwith’s Almanac”. Figure 16. Advertisement from the 1883 “New Haven Directory”, indicating a move from 251 Chapel Street to 71 Church Street. Roessler also began sharing space with watchmaker John R. Cramer. Figure 17. 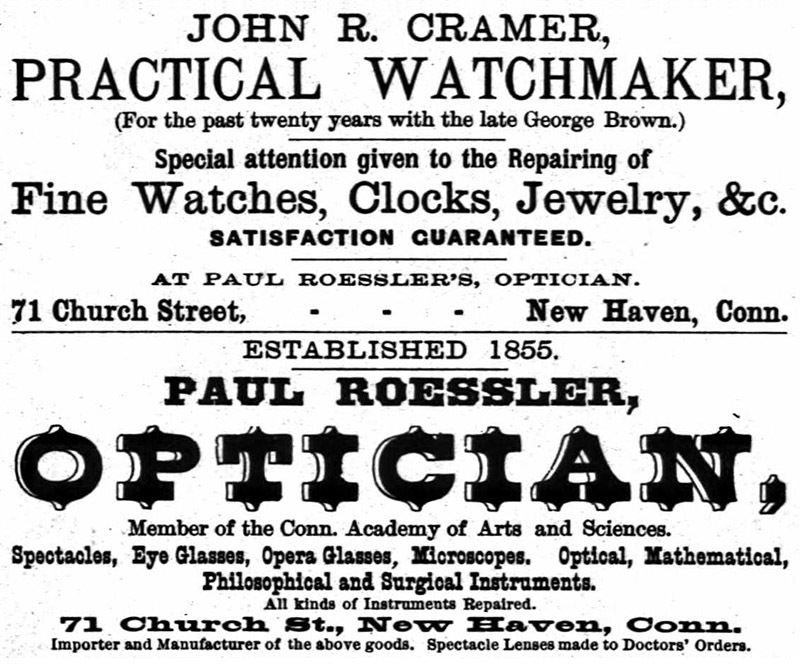 1888 advertisements from the “New Haven Directory”, indicating that Roessler and watchmaker Cramer had moved to 816 Chapel Street during the preceding year. Figure 18. In 1890, Paul Roessler formed a partnership with W.F. and R.P. Sternberg, and began operating as “Paul Roessler and Company”. Figure 19. Paul Roessler retired during 1893, and was replaced in the partnership by his son, Fritz. Figure 20. (A) An 1893 advertisement, indicating that production of “Gray’s Microscope” had passed to Queen & Company, of Philadelphia. This coincided with Paul Roessler retiring from the business, and being replaced by his son, Fritz. The conformation of the Queen microscope is different from Roessler’s version (B). Figure 21. The firm became “Paul Roessler’s Son” in 1894. Figure 22. An 1897 advertisement, from “The Yale Scientific Monthly”. Thank you to Joe Zeligs for constructive conversations and for providing images.